If you haven't noticed by now, I am in love with essential oils. (Sorry husband, it's true.) They are all-natural, they have disinfecting properties, there are so many ways to use them, they don't go rancid, they're so cute . . .ahem, I digress. Even though they might seem expensive, they are super concentrated and a little goes a very long way. 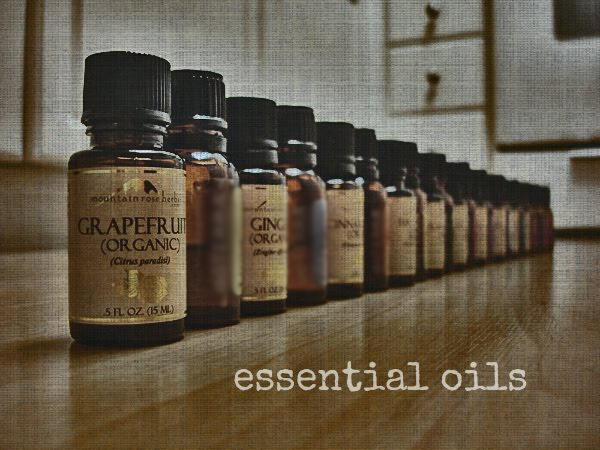 When I was creating a recipe for homemade mouthwash, essential oils made perfect sense. I could make a mouthwash with real oranges, ginger, and cloves, but who wants to go to all that trouble when it only lasts about a week in the fridge and there's an easier way? I wanted a recipe that is simple. Simple to make, simple to use, simple to store. Look no further. Click on the orange links to learn even more about each essential oil. Don't limit yourself to the essential oils I chose. Most essential oils have disinfecting properties, so feel free to use other essential oils. Here are a few additional ingredients, but certainly not all, that can be used in a homemade mouthwash. Not only is it chemical and alcohol-free, it's practically free! Okay, not really. But it's close. Check out those savings!! You can find essential oils at your local health food store, Amazon, and Mountain Rose Herbs. Click here to see more ways to use essential oils. Click here to learn about essential oil safety. Have you made homemade mouthwash? Please share! My husband is hooked on Listerine (mostly because the dentist said he had to use it) so I make a mix of 1/2 Listerine, 1/3 hydrogen peroxide and a little water with tea tree oil. It still tastes of Listerine, but makes mouthwash a lot cheaper! I LOVE this! I am new to essential oils. Just heard of one called deep blue I am interested in trying. Have you tried it? I would love to know your favorites! Peppermint--Some mosquitoes got into our house and were biting us at night so I mixed a cup of water and a couple drops of peppermint EO in a spray bottle. I sprayed myself and the kids with it before bed and it kept the mosquitoes away. My husband refused to use it and got bit. I'd love to hear everyone else's favorite essential oils! Thanks Kendra! This helps a lot. I have been looking for a mouthwash recipe, this sounds great. My family uses deep blue all the time, it is one of our favorites! you need to put out a pamphlet so all these homemade ideas are in one place. My dog has allergies and I am trying some homemade topical ingredients to help him. You are doing a great service with your blog and I have sent it to friends to sign up keep up the good work. Thank you for your kind words and sharing my blog with others!! It means a lot. Please take your dog off commercial dogfood that has him eating corn, etc. Firstly, it's GMO, but many allergies are due to improper feeding. I have made tea tree mouthwash for my son's abscess before. We can't use Listerine anymore because it has alcohol in it. I think I'll make this up for my dh and see how he likes it. Thanks for linking up at Frugal Thursday Rewind! I was just thinking about starting to use mouthwash. Thanks for sharing this recipe. Do you find that the clean feeling lasts? I think it does. I used my homemade mouthwash 30 minutes ago and my mouth still feels clean. You can always add more peppermint essential oil or cinnamon essential oil for a more fresh feeling that lasts longer. It is my understanding that peppermint can cause or worsen acid reflux - just fyi. You are not swallowing the mouthwash so it shouldn't cause a problem with acid reflux. This is a great DIY mouthwash. I'd love it if you linked up at my new sustainable living link-up, Small Footprint Friday! Thank you for sharing this! It looks doable! Great idea, thanks so much! Erin Following you on facebook! GReat idea! Thanks for sharing them. Hmmm, do you think if I replaced one of these with what is in my husband's mouth wash bottle he will notice? Do you really think a few drops of peppermint oil will do the trick? Very cool! I love your blog! I do want to say that you should be careful using lavender and tea tree oil because they are estrogen mimickers. That orange spice one sounds amazing! I bet it feels really good to swish with that. Thanks for linking to Healthy 2day Wednesday. Hope to see you back this week! I tried the peppermint mouthwash on my 16 year old who was getting ready to go to a dance and didn't want stinky breath! It worked like a charm and I felt great about giving him something that would not harm him! I will be sharing this post for sure! In fact you are one of the resources I recommend on my website! Thanks for all you do, Kendra! Thank you so much Sabrina! I'm glad to hear the peppermint mouthwash worked so well! I would go for the orange one, it seems good and I hope I will get good results by using it in the future. I love your post. And I’m new to essential oil. I checked these oils with one ayurvedic doctor from internet. He said there is no side effect of using these oils since they are 100% natural. Thanks for sharing these type of things with everyone. I'm a clinical aromatherapist & there are "side effects" or rather what we term contraindications of essential oils. Yes, they're natural, but they're plant chemicals. If you use them irresponsibly you can harm yourself & others. Here are some examples of EO potency. One drop of peppermint oil is equivalent to 60 cups of peppermint tea. One drop of lemon oil will eat through styrofoam in 10 minutes. The citrus oils are photosensitive, meaning for 24 hours after use, you can burn. I'm not saying they can't be in a mouthwash, but if you manage to get some of the orange oil on your lips or around your mouth area (on the skin), you're open for a sunburn at the very least, possibly a severe chemical burn depending how much got on you & how intense the sun is. Clove & cinnamon are both skin irritants & pregnant women & children under 18 should NEVER use them. They are both what we call "3 DL or less" (DL meaning dose limit). Essential oils are also more potent in water than in carrier oils. Please check for more information by Jade Shutes, Valerie Ann Worwood, and Susan Worwood. They have some great books out with recipes for this type of thing as well as all contraindications that people really need to be made aware of prior to making anything for anyone, including themselves. Essential oils are also harmful to cats & reptiles. Dogs & horses can have them, but the same dose you'd use on a small child. And really only lavender & tea tree should ever be necessary. Where I've been trained, we're taught, don't always go to the essential oil that the direct herb or plant can heal in a less intense form. And regardless of what some of these essential oil distributors say, essential oils truly are not safe for ingestion. Ever. Which does not apply to the mouthwash, unless you're dealing with someone who swallows their mouthwash more often than just gargling/swishing it. I'm sorry if this comes off wrong. Some of these comments on here worried me & I felt compelled to share some of the safety info I had drilled into my head for months. Thank you so much for sharing! It's great information for everyone to know. I just wanted to thank you so much for all you do for this site! I have learned sooo much! I really wanted to provide an all natural, safe environment for my family without breaking the bank! I go on your website everyday, and I really consider this to be a blessing. I have saved so much money.. Thank you so much. I sincerely appreciate all you do. Thank you for your kind words Melanie! I LOVE this. I tried another DIY mouthwash before (with apple cider vinegar and water) and it was unbearable to use. Peppermint sounds much, much, MUCH better! I have tried so many mouth washes with artificial chemicals. Thanks God I have found natural one. Thanks for your information. 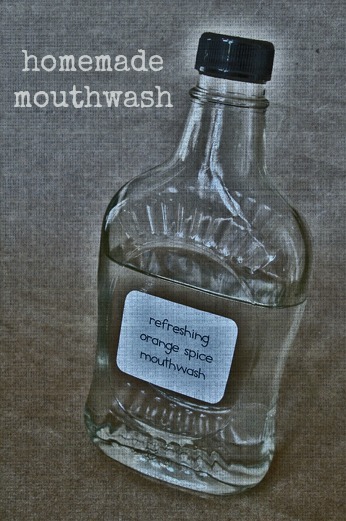 I love orange spice mouthwash. Wow great idea for a homemade mouthwash! I wasn't able to use the commercial ones since they have a whole lot of alcohol and I suffer from teeth sensitivity. I am suffering from gum bleeding, is this fine for that? Probably but better check with your dentist. Just found your great blog! I'm a mom of 8 and have always tried hard to get natural non-processed food into my kids, but for some reason never thought much about cleaners and bath items. We use lots of home remedies when possible for simple sicknesses, but I'm just blown away by your informative blog. Just today I have already made this peppermint mouthwash, the baking soda hair wash and the cider vinegar hair rinse. I also used your recommendation on the oil face wash in that I just used straight EVOO because my 45yo skin seems so dry and dull lately. My skin feels amazing today! Thank you again and I've pinned your blog and will find you and follow you, too. Thank you for your kind words! I'm glad it's been helpful!